After arriving by coach from the nearby town of Turnhout, day one of the festival (Friday) for me kicked off with NWOBHM legends Raven (7), who in just 40 minutes produced a highly charged and entertaining performance drawing on classics such as “Take Control”, “Grip”, “Live at the Inferno” and the rousing “Break the Chain”. Amazingly vocalist John Gallagher can still reach those ear splitting high notes whilst brother guitarist Mark was also on fine form with an array of axework heroics proving that Raven are still a live force to be reckoned with and a damn fine way to commence Graspop. Shortly after though it was time to take my first trip to the main stage to check out Revamp (6) (ex-After Forever vocalist Floor Jansen's new band) having not heard them before. Naturally then I was expecting something musically along the lines of her old band and while this was in part the case (a tad heavier as well), there is clearly still some way to go in the songwriting stakes as the material aired did unfortunately come across as quite uninspired and pedestrian. A shame perhaps as Floor is and was a fabulous frontwoman and vocal talent although I'm inclined to wait for the second album before making any more judgements. Following Revamp the next band on my check out list was Krypteria (9) in the Marquee 1 tent and, in sum, all I can say is 'wow!'. Yes, as so often is the case at festivals, there are always one or two bands that you're not expecting much from that subsequently blow you away and this year Krypteria were undoubtedly one of those bands. Indeed show wise everything was virtually perfect from the sound to the dramatic lighting display to the highly accomplished performances, the latter absolutely epitomised by vocalist Ji In Cho. Okay she may not have the sheer power and range of some of the top female metal vocalists today but she can certainly move, twist and work the stage with the best of them whilst skillfully working up the crowd, making even someone like Doro look tame! Just a pure delight to watch and marvel at really. Song wise the superb sound made the likes of “Sweet Revenge”, “Scream”, “Somebody Save Me” and finale “My Fatal Kiss” shine brightly (even if all the material was just taken from the last two albums) providing the icing on an extremely tasty cake. Overall, pure class and like I said before: wow! Following the magnificence of Krypteria was never going to be easy yet the next band on my list, The Poodles (8) did a very good job indeed despite early sound difficulties. Again a fantastic (and flamboyant) performance (especially by frontman Jakob) was the key, coupled with some of the best catchy anthemic hard rock of modern times in the form of: “Metal will Stand Tall”, “Like No Tomorrow”, “Thunderball”, ballad “One out of Ten” and of course the instant hits “Seven Seas” and “Night of Passion”. 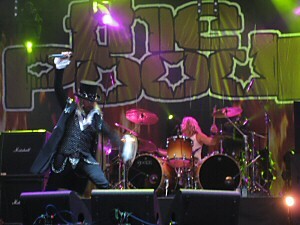 In fact, as the Graspop line up this year tended to favour the more extreme bands over the more melodic outfits, it was truly refreshing to have a band like The Poodles on the bill and from the large crowd gathered I clearly wasn't the only one relishing some good old fashioned sleazy rock. Soon after The Poodles however it was one extreme to the other with the arrival of thrash legends Slayer (7) on the main stage and a sea of devil horns to mark their presence. Yet while I'm sure two thirds of the festival crowd were there for them, on this occasion the band were surprisingly only workmanlike - nothing more nothing less. Perhaps Slayer are not used to coming on so early (4.25) with only an hour to play but unfortunately today they came across as slightly underwhelming and lacking a killer edge. With audience song interaction and banter kept to a minimum luckily the songs still did the talking and they couldn't fail with the likes of “Mandatory Suicide”, “Seasons in the Abyss”, “Angle of Death, “ South of Heaven” and “Raining Blood”, yet something was still clearly missing (and in many people’s view it was the Saturday night headline slot!). Solid if unspectacular. Still no time for a break from Friday's packed band schedule it was Therion (8) up next, a band I was seriously looking forward to partly on the back of their reputation. And luckily overall they didn't disappoint at all despite an hour long 'taster' show (presumably minus some of the regular stage production elements) which still showcased a band of sublime talent, musicianship (with four separate vocalists!) and songs, from the opening orchestration of “Rise of Sodom and Gomorrah” to epic closer “To Mega Therion”. Innovators they certainly are and live such varied songwriting was certainly a joy to behold. In fact perhaps the only downside was simply how short it all was - more like a trailer to a movie rather than the movie itself. Time now to book a ticket for their Autumn tour on the basis of this display though. Following Therion I finally managed a much needed hour break before having to make an agonising choice between Tarja or Doro for my next band. In the end it was the Metal Queen who took the honours and with a capacity crowd in for the ride Doro (8) simply couldn't fail nor does this lady ever put on a bad show. Working the crowd as hard as ever she was quite simply on amazing form tonight, delivering the goods as always and further cementing her goddess like reputation (and her place in my heart!). Set wise there were the usual winners (“Earthshaker Rock”, “Metal Racer”, “True as Steel”, “I Rule the Ruins” and “All We Are”) although it was also touching to hear a tribute to the late Ronnie James Dio in the form of “Egypt (the Chains are On)” and a very heartfelt vocal showcase on “Fur Immer” - still her best ballad. A triumph all over then and the first gig to get me properly sweating! By the end of Doro, Motorhead had just opened up on the main stage although by now I was conserving my energy for Saxon (9) at 10.00 in the evening which luckily paid dividend by the time they hit the stage in the Marquee 2 tent (which coincidentally suited them far more than the main stage back in 2008). Well, for anyone who's seen Saxon before (i.e. the majority of us) you'll know I probably don't even need to write this mini review. Yes this is Saxon, a band synonymous for consistency on record and likewise in the live arena where they never ever disappoint and tonight was no exception as Biff and the boys tore through a juggernaut of a set: “Heavy Metal Thunder”, “Dogs of War”, “Wheel of Steel”, “Princess of the Night”, “Crusader” and “Denim and Leather” - need I say more? As a long term fan (this was my sixth time seeing them) it was also especially pleasing to witness the return of “20,000 Feet”, “And the Bands Played On” and “The Eagle has Landed” to the set – all lapped up just as much as the classics by the colossal crowd. And judging by the crowd reaction by the close, if Saxon did come back next year I wouldn't be at all surprised if they were headlining. So finally after eight bands in just the first day, I made a final push towards the main stage to catch headliner Aerosmith (8), a band I confess I've never been a huge fan of yet was more than willing to see on the strength of their reputation. And while its true that the general reaction was lukewarm at best (perhaps due to that 'last band of the day' syndrome) Aerosmith were still certainly entertaining if perhaps a little subdued tonight partly because there was limited crowd reaction to feed off. Nevertheless Steve Tyler on an off day is still a consummate performance with an infectious swagger (and seems impervious to ageing!) whilst his partner in crime Joe Perry (or indeed the whole band) cannot be faulted musically. Indeed, the songs do remind us why they are headlining in the first place: “Love in an Elevator”, “Back in the Saddle”, “Falling in Love (is Hard on the Knees)”, “Eat the Rich”, “Livin on the Edge”, “Mama Kin”, “Dream On”, “Draw the Line” et al – all bona fide rock classics. Tyler's emotional performance on “Don't Wanna Miss a Thing” was also especially memorable whilst “Sweet Emotion” and set closer “Toys in the Attic” are staples for a good reason. If there was a weakness in the setlist it was the inclusion of an instrumental blues medley which stretched on far too long and could have been filled with more hits. Still it was minor complaint for a band that were not at their best but have still 'got it' after all these years and for that reason alone they should be applauded. A fitting end to a day of never ending bands! Following yesterdays draining band schedule, today thankfully there were far fewer acts I wanted to catch allowing me some time to check out the metal market and soak up some sun. Nevertheless, I was still there from the start of the day specifically to catch Iron Mask (7), a very underrated prog power band whose last two albums (“Hordes of the Brave” and this year’s “Shadow of the Red Barron”) have been amongst my most played discs of late. And live I'm happy to announce they were as impressive as on record as the band tore through a stunning set including such gems as: “Holy War”, “Resurrection”, “Crystal Tears”, “Black Devils Ship” and “Forever in the Dark” - basically neo-classical metal near its best. It was definitely a shame then that the muddy sound did them no favours despite the solid performance from all the band members, especially Petrossi's furious Malmsteen-esque workouts. Nevertheless this was a very convincing rare show for Iron Mask and as a result lets hope a full tour will be forthcoming as these songs are simply too good to not be played. After Iron Mask I had an hour off before trekking to the main stage to indulge in some more prog power metal heroics courtesy of Sabaton (9), yet another band on my must see wish list. And although it was still early in the day, a massive turnout for them suggested something special … and that's exactly what we received. Perfect sound, stupendous songs and endearing musicianship and performances equalled one of the best bands of the weekend from the opening symph riffs of “Ghost Division” to the dying notes of “Metal Machine” - basically a well oiled killing machine producing all the goods. 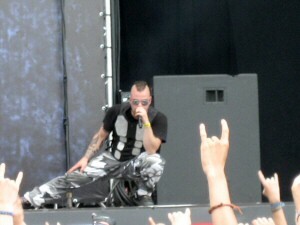 Sabaton further clearly don't take themselves too seriously (i.e. vocalist Joakim Broden's gay tongue and cheek stage banter) which given the warfare subject matter of the songs might be a little perplexing although on the basis of this fantastic performance they are certainly forgiven. In summary they're a band going places fast so check em out pronto. After the heroics of Sabaton I had the best part of an afternoon to kill, so a trip to the metal market was in order conveniently missing Cannibal Corpse in the process (smile). 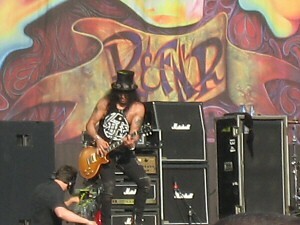 By late afternoon however I was ready for Slash (7) on the main stage who provided a welcome hard rock set in the afternoon sun. Having not heard his solo material before however I (and presumably the vast majority of the crowd) was of course holding on for the Guns n Roses tunes which eventually arrived in the form of: “Night train”, “Civil War”, “Rocket Queen” and the immortal “Sweet Child O Mine” and “Paradise City” - the latter two in particular enticing me to sing along emphatically. It was a nice tight display as well from the whole band even if Slash's solo work seemed considerably weaker than the songs we had all come to hear. Still, from hard rock onto gothic metal, it was Paradise Lost (6) who were next up next door in the Marquee 1 tent - a band I thought I'd catch just out of curiosity and as something a little different from my usual traditional rock and metal leanings. Unfortunately after this performance I won't be changing my musical alligences any time soon for while Paradise Lost went down well with the faithful, I just can't see much of the attraction myself with quite frankly lifeless songs that just drag on without anything resembling a chorus. Yes its mood/atmospheric music I know but despite some good melodic solos, nothing seemed to grip me or indeed from the static performance of the band themselves. In direct contrast, Airbourne (9) a few hours later were the mirror opposite and for me win the most frantic and energetic band of the weekend award. Of course I'd heard alot of hype about them beforehand but nothing can prepare you for the total rock n roll onslaught that is Airbourne live. Right from the off the amassed crowd went berserk to such future classics as “Raise the Flag”, “Chewin the Fat”, “Diamond in the Rough”, “Blonde, Bad and Beautiful”, “No Way but the Hard Way” and “Runnin Wild” - just pure rock n roll magic from a band currently at the top of their game. Of course this style of AC/DC rock always works wonders live although it takes a band with the conviction of Airbourne to really ram it home, which in this case included all the members working every inch of the stage and headbanging like their lives depended on it. In fact at one point vocalist Joel O’Keeffe scaled the heights of a nearby lighting rig post whilst still managing to play and rock out! How rock n roll is that?! By the end of proceedings the house was an absolute sweat bath and the band left the stage as total rightful heroes. 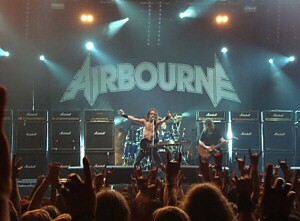 So Airbourne came and conquered and with all the media attention now fixed on them, who knows where they'll be in a few years? By the end of Airbourne I was ready to call it a night although still did manage to catch a bit of headlines Soulfly who seemed to be giving a good account of themselves despite some controversy over their choice as the Saturday headliner. Overall though it was another fine day of bands – all of them I had never seen before. Roll on round three! So onto Sunday and the final day of the festival and like yesterday I was more selective in the bands I saw again steering clear of the more extreme metal acts. First up on the main stage then were Swedes Evergrey (7) who only pulled a small crowd for their short set yet gave us a tight strong slice of heavy prog metal with some good sound (namely the keyboards were high in the mix). Musically they may not be pushing any boundaries but songs like “Blinded”, “Obedience”, “The Masterplan” and “A Touch of Blessing” are crowd pleasers all the same even if today's performance by the band did not appear their most enthusiastic. 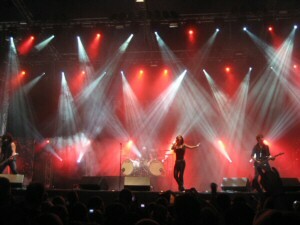 There were no worries for lack of band or crowd enthusiasm for Alestorm (9) though who were welcomed as returning heroes after their blinding Graspop show back in 2008. And rightfully so for the band were on top form today launching into one pirate metal classic after the other including: “Black Sails at Midnight”, “Wenches and Mead”, “That Famous Ol'Spiced”, “Nancy the Tavern Wench”, “Keelhauled” to name selection. In fact absolutely every song came off as a winner while this time around everyone knew the words to sing along to, much to the band's delight. But at the end of the day its really the fact that Alestorm know how to entertain which makes them so endearing (and with a good dose of humour thrown in) so when leading vocalist/keyboardist Chris Bowes asks for a pit the size of the main stage during “Captain Morgan's Revenge” that's exactly what he gets! They might not have been donning their trademark pirate gear like in 2008 but today's appearance was just as memorable in its own way from a band that always set sail and conquer. Bloody marvellous! By mid afternoon, the scorching sun was still showing no signs of mercy as I approached the main stage baking, bruised and bloody dehydrated to catch Jon Oliva's Pain (7), who's recent solo efforts (in contrast to Slash yesterday) are, in my opinion, certainly up there with his work with Savatage. It was a pity then that only two tracks from the new album “Festival” made the set which also seemed unusually short and therefore was dominated by Savatage classics. Still, I'm not complaining about the likes of “Sirens”, “Gutter Ballet”, “Jesus Saves”, “Believe” and of course “Hall of the Mountain King” - all worthy numbers on any setlist and duly appreciated by the crowd. JOP were also spot on musically even if Jon did admit to some technical problems and being troubled by the savage heat (as were we all!). Overall therefore the show acted as a good introduction to JOP but I imagine a full indoor set would be a worthier representation of the Mountain King at his best. After JOP, some serious downtime was in order to conserve my energies for headliner Kiss so I did end up missing the likes of Korpiklaani, Finntroll, Devil Driver and Amon Amarth all which I'd heard some positive reactions to. Tonight for me however was about one band and one band only … KISS! Yep, Kiss (10) were back at Graspop once more following their less than perfect show in 2008 (which if I remember was plagued by sound difficulties whilst for various reasons I also had to leave before the encore!) this time as part of the Sonic Boom European leg tour and tonight I was finally rewarded with the full definitive live Kiss experience. Now of course people tend to either love or hate them (there's no middle ground) but even the harshest of critics would have to admit they always put on one hell of a show – pyro rockets and flames at every opportunity, unparalled lighting effects and visuals, fire breathing, blood spurting, smoke and confetti, Paul Stanley gliding over the crowd to the central lighting rig and an array of other treats. 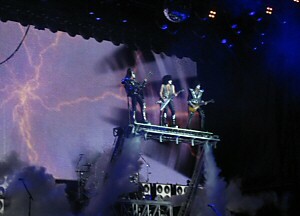 In fact words do no justice to seeing Kiss in full action and the breathtaking spectacle of it all so trust me this really was as good as it gets. And then there were the songs: “Cold Gin”, “Let Me Go Rock n Roll”, “Firehouse”, “Shock Me”, “100,000 Years”, “I Love it Loud”, “Crazy Crazy Nights”, “Black Diamond”, “Say Yeah” - all part of the main set - and then an encore consisting of: “Lick It Up”, “Shout It Out Loud”, “I Was Made For Lovin You”, “God Gave Rock n Roll To You” and finally “Rock and Roll All Nite”. Hows that for rock n roll heaven? And the performances? Spot on? Of course, for Paul, Gene, Ace and Peter aren't just musicians, they are bona fide entertainers and a finely tuned and drilled team of performers who never fail to deliver on every level. Therefore by the end of the mammoth set, as the paper confetti rained down on me during “Rock n Roll All Nite”, the whole crowd knew we had just witnessed something very special and perhaps in my case for the very last time. In other words Kiss tonight were a priceless memory in my gig history and the absolute perfect way to conclude this year’s Graspop festival. We wanted the best and we actually got it. So another Graspop festival came to a close in style and over the past three days it was indeed such a pleasure to see so many different bands of different metal genres adding immensely to the variety on offer. No complaints either about the organisation of the festival which was up there with Wacken and others even if those band tents were hot! Still, over 130,000 metalheads over the course of the weekend cannot be wrong and just demonstrates how popular the festival has become on its 15 th anniversary. Roll on 2011!